Gunnison Valley quarterback Caden Madsen looks for a completion against South Sevier last Friday night. 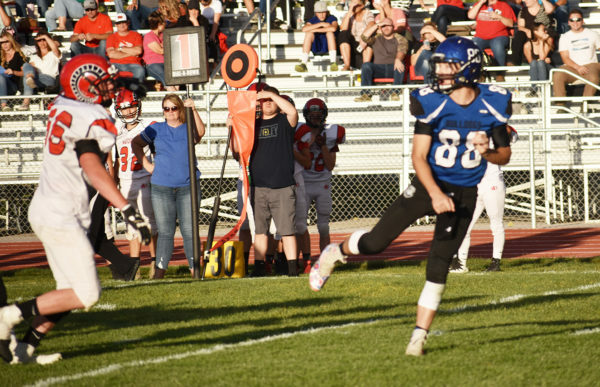 The Bulldogs fell to South Sevier, 28-63. GUNNISON—The Gunnison Bulldogs could not overcome a horrible start against the South Sevier Rams in which the Bulldogs gave up 23 unanswered points in the first quarter on the way to a 28-63 defeat. Center-quarterback exchange woes continued for the Bulldogs in the game last Friday, Aug. 31, as two early snaps sailed over quarterback Caden Madsen’s head, leading to a South Sevier touchdown and a safety. The Rams scored on their next two possessions and had a 0-23 lead before the first quarter was half over. The injury bug made its appearance, too. Senior starters Thomas Yardley and Ty Hill were both sidelined before the game began, which took out two key linemen for the Bulldogs. Gunnison Coach Jack Pay made a switch at center after the first three series in the game and had junior Brandon Tucker take over for the duration. The move settled down the offense, eliminated the bad snaps and enabled Gunnison to start putting some possessions together. However, the Bulldogs could not find an answer for big Rams running back Tyson Chisholm. Chisholm wound up scoring six touchdowns and was a primary force for the Rams. After starting the half behind 6-43 at half, Pay was able to make some adjustments, and his team came out with a little more fire. The Bulldogs took the opening possession and scored, and the crowd felt a little excitement. However, Gunnison was not able to stop the Ram running attack and could only keep pace with South Sevier the rest of the game. Gunnison will travel to Enterprise this Friday. Kickoff is at 7 p.m.